In their continuing campaign to positively mold the public image of the conservative extremist U.S. Sen. James Lankford, The Oklahoman editorial board over the weekend noted it was “praiseworthy” he had made public on his government website the proposed nuclear agreement with Iran. The praise isn’t too much over the top, true, but, it should be mentioned anyone can find the same document in a lot of places, including on the White House site here. 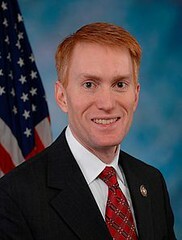 Lankford, of course, is against the proposed deal, which I will get to in a minute. The Oklahoman makes the argument, “The more public views are shaped by concrete information, the better.” Again, all true, but the document is widely available. A simple Google search takes anyone to ample places to find it. In fact, it’s now available through a link on Okie Funk. Where’s the praise for Okie Funk, which just published its 1,500th blog since 2004? Obviously, the language here is quite technical. The crux of the agreement is that Iran will NOT develop a nuclear weapon and consequently sanctions against that country will then be ultimately lifted. Under the agreement, the International Atomic Energy Agency would be allowed access to monitor Iran’s nuclear activity. Here’s a New York Times guide on the agreement. I find the agreement positive and historic, and a way to establish better relations with an important Middle East country. It’s a much better path than trying to bomb Iranian nuclear facilities, as some political leaders would have it. I believe most Americans are growing tired of the human and financial cost of perpetual war. In the end, if Iran DOES violate the agreement it gives the U.S. and its allies more credibility to sanction the country or even attack it. What’s even more important to realize is that all bets are off if the U.S. believes it’s getting threatened by a nuclear attack by Iran or any country. Lankford, of course, doesn’t view the agreement in this way, and he went on the Senate floor to express his views. The speech, which you can find here, is fairly typical for a conservative hawk. Essentially, the argument is that the agreement doesn’t go far enough to reign in Iran’s nuclear program, and it contains loopholes that allow Iran to escape detection of building a nuclear weapon. It’s not difficult to suspect that Lankford’s main reason for opposition, however, is the general Republican policy to reject anything proposed by President Barack Obama as a political gambit. My concerns are there are loopholes in this agreement big enough to drive a truck through, specifically this truck is the truck that is big enough to drive through. I’ve tried to wrap my head around the syntax and structure of that sentence, especially beginning at the word “specifically.” Did Lankford have a photograph of a monster truck on a screen behind him as he uttered these words? To me, the phrase “this truck is the truck that is big enough to drive through” means driving through the truck, not the loopholes. A minor point? Simply an awkward sentence? Perhaps. We can understand Lankford’s meaning in the context of the overall speech. But The Oklahoman editorial board continues to try to place an aura of “the wise sage” around Lankford, even though it has become clear he’s as much an ideologue and panderer as U.S. Sen. Jim Inhofe. Just using a “truck” metaphor alone shows his opposition to the agreement goes beyond his concern for his argument. He’s concerned about his truck-owning base of voters, too.